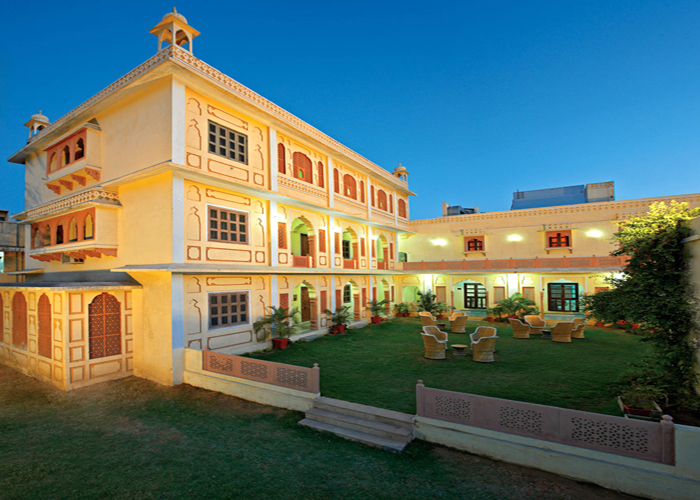 One of the finest heritage hotels in Jaipur, Chirmi Palace is located 11 km from the nearest airport, and just a km from the closest railway station as well as from the bus stand. Chirmi Palace is a heritage property more than 160 years old, now converted into a plush hotel. Situated in the heart of Jaipur city, the hotel is run by Thakur Vikram Singhji, a descendant of the Chomu dynasty. The exquisite dining hall at Chirmi Palace in Jaipur, attractively decorated with frescoes and murals portraying scenes from the daily lives of the Rajput royalty, serves delicious preparations from Continental and Indian cuisine. Besides, a Rajasthani theme dinner can be arranged in the lawns. A beautiful land dotted with golden sands, imposing forts, and quaint palaces, mansions and gardens, Jaipur is popularly known as the Pink City of India. Situated in the North Indian state of Rajasthan, Jaipur is home to several tourist attractions including the 18th century Jantar Mantar, the Nahargarh Fort, Diwan-E-Am and Diwan-E-Khas, Govind Dev Ji Temple, Hawa Mahal, the Birla Planetarium, Sisodia Rani Ka Bagh, the Vidyadhar Gardens, etc.